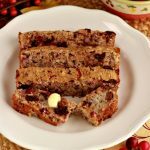 A paleo fruit and nut bread that is healthier and so much better tasting than fruit cake. 1/4 cup unsweetened apple sauce. 1/3 cup milk of choice: unsweetened coconut milk or almond milk. 1 tsp organic GF orange extract *optional. ¾ cup fresh cranberries minced (I chop mine in the processor or blender for a few seconds). 1/4 cup pecans chopped *optional, can omit for nut free. Preheat oven to 375 F, and grease a 9x5x2 inch loaf pan. In a large mixing bowl combine: 3 eggs, maple syrup, milk of choice, melted butter or coconut oil, vanilla extract, lemon or orange zest, apple sauce, minced cranberries, and baking soda-apple cider vinegar mixture. Stir together thoroughly. Add to mixture in bowl: coconut flour, golden flax meal. Stir in thoroughly. Add to batter the optional pecans and chocolate chips. Mix in well. Spoon batter into loaf pan and spread evenly in pan. Bake at 375 F for about 28 to 32 minutes, or until tooth pick comes out of center clean. Cool, slice and serve. Store any left-over portions in fridge.